WHEN: The exhibition runs through Saturday June 3, 2018. The gallery will be open from 12 - 5pm Wednesday through Saturday and by appointment. WHERE: Hancock Solar Gallery is located at 20 E. Lanvale Street on the ground floor of the Nelson Kohl building. 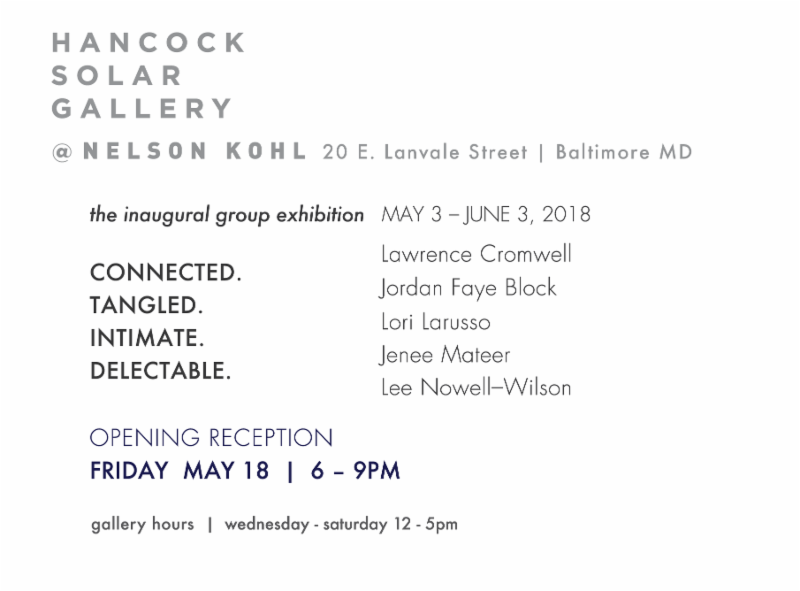 HANCOCK SOLAR GALLERY is thrilled to present CONNECTED. TANGLED. INTIMATE. DELECTABLE., the inaugural group exhibition at the new gallery. 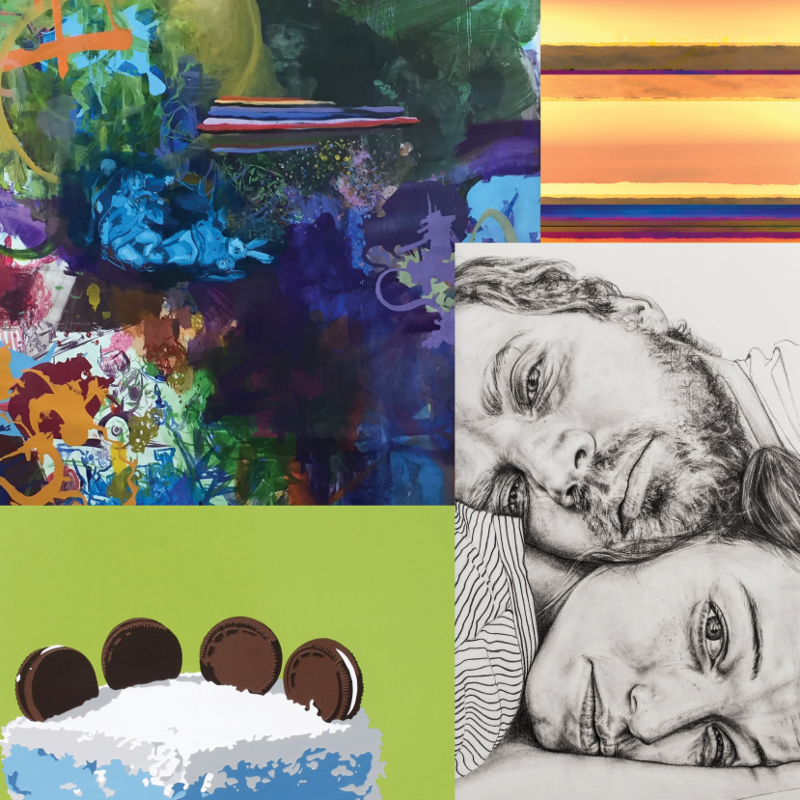 This exhibition features the work of Lawrence Cromwell, Jordan Faye Block, Lori Larusso, Jenee Mateer, & Lee Nowell-Wilson. The Hancock Solar Gallery was founded and named after Paul Hancock & Patricia Solar, investors in the Nelson Kohl. They believe that art is an integral part of life and it changes the perspective of those who engage with it. The gallery aims to promote the thought-provoking work of Baltimore's artists in the heart of the city's oldest arts & entertainment district - Station North. It is independently curated by Jordan Faye Block of Make Beautiful Change. Connected. Tangled. Intimate. Delectable. The work in this show encompasses all of these things. Each artist's work embodies ideas about connection, how people are intertwined, how their stories are interrelated and crisscrossed. Things are tied together, the macro is micro, what you see on a cellular level is the same in large structures - take architecture and then look at cells under a microscope. The philosopher Husserl has said that we are the one and the many, a larger part of a greater whole. I do believe that everything is always connected. Our lives are this way. The work is this way. Jenee Mateer uses photography to explore both vast and intimate landscapes, taking her photographs digitally, layering them and combining them to create infinite patterns, montages, and at times juxtaposing black and white photography with scanned watercolors. In the paintings of Lawrence Cromwell, from afar they appear to be colorful and abstract with a variety of shapes lines and forms. When you get closer to them a looming narrative is revealed, the figures emerge and then morph into unexpected shapes that feel familiar yet mysterious. Lori Larusso's paintings distill the essence of their domestic subject into a bright clean image (a bourbon cocktail, a slice of cake). The work hints at an underlying struggle for meaning and the search for happiness in everyday life, at the same time elevating the mundane into sweet perfection. In the large photorealistic painting by Jordan Faye Block the intimate is abstracted into lines that hover between intersecting patterns and undulating landscape. Using both intense detail and deliberate simplicity in her beautifully detailed graphite drawing, Lee Nowell-Wilson explores personal connections, intimacy, and vulnerability. These five artists come together to bring us a connected look at our lives, the everyday, the complex and the vast.